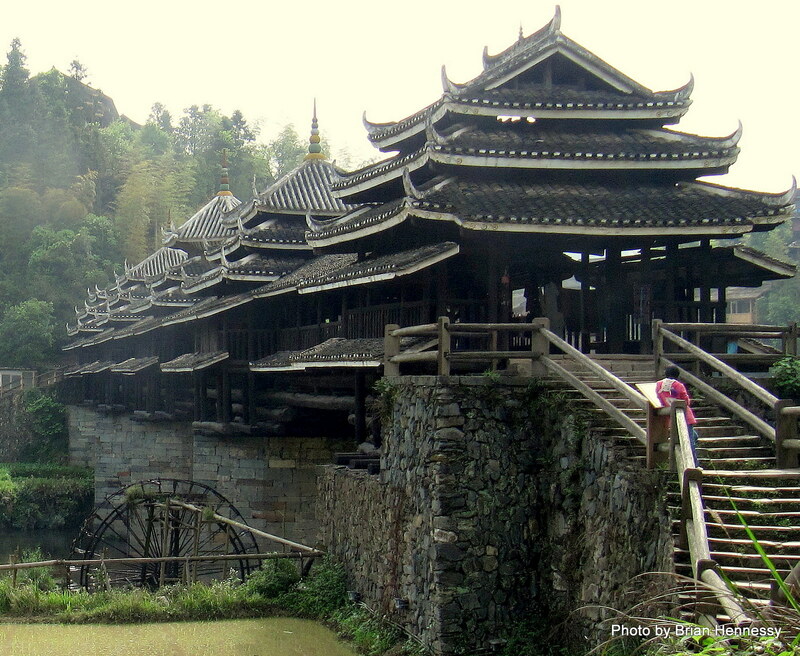 Sanjiang is about a five hour journey from Guilin, and a two and a half hour bus-ride from Longsheng near the Dragons Backbone Rice Terraces. 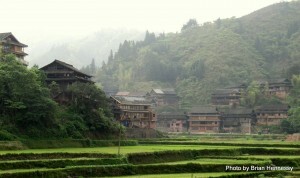 It is the last sizable township in the province of Guangxi before entering neighbouring Guizhou and is the centre of the Dong Minority Autonomous County. 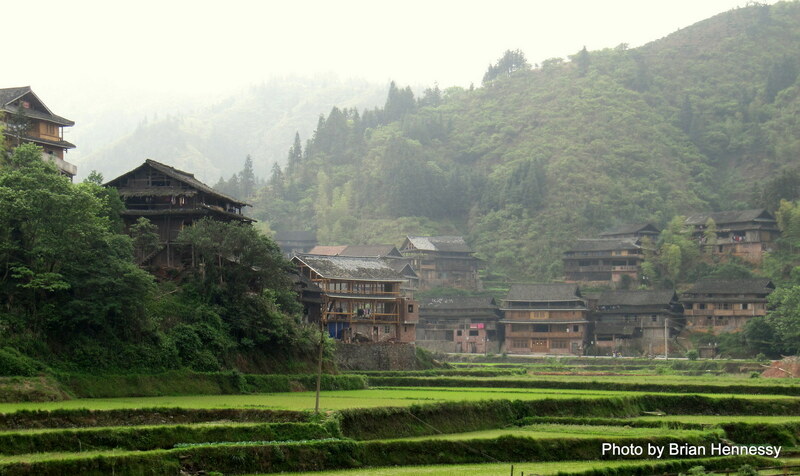 My purpose for visiting here was to look for the village of Chenyang and its famous Wind and Rain Bridge (click photos to enlarge). 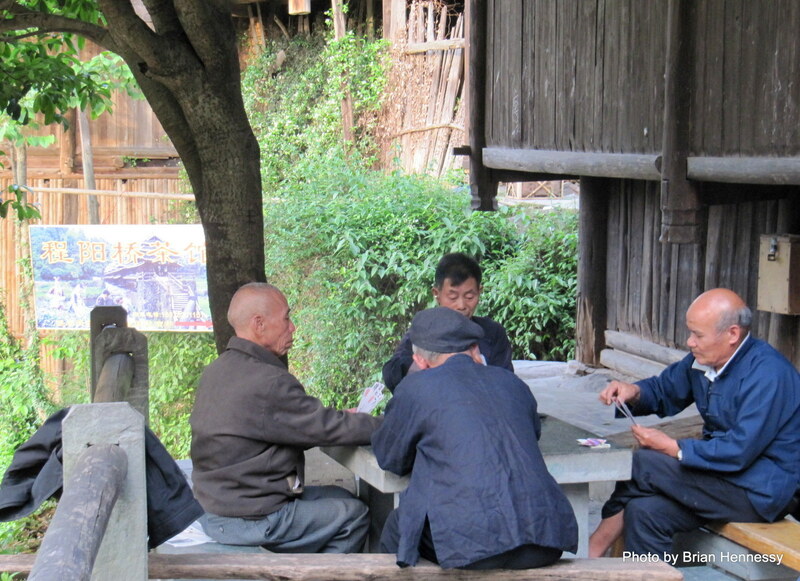 Dong minority people usually live in small villages beside streams in the mountainous borderlands of Guangxi, Guizhou, and Hubei provinces. They are descended from ancient tribes who lived in the Guangxi and Guangdong province region over two thousand years ago, and in the 21st century they do their best to live a traditional way of life. 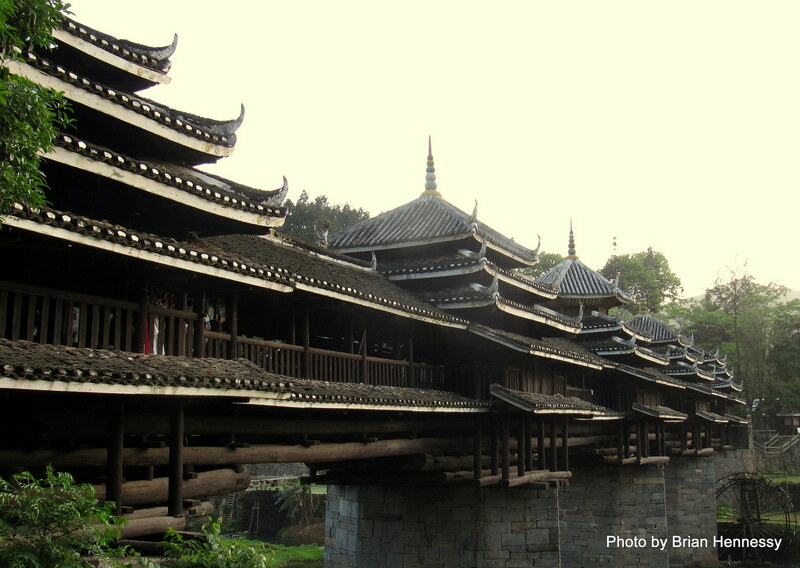 Their houses are two or three storied wooden structures – the top stories for people and the ground floor for animals and firewood – and are built on higher ground above the rice paddies, streams, and water-wheels below. 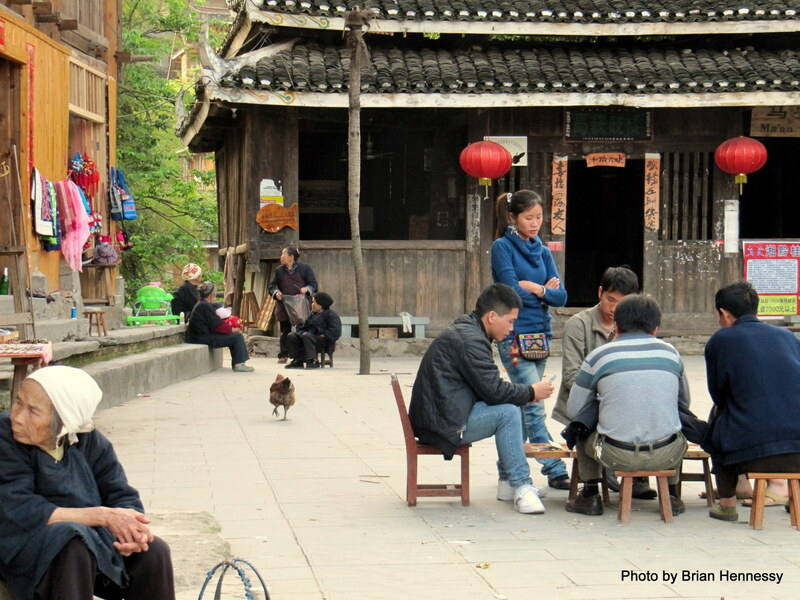 Cultural identity is strong in these charming places. 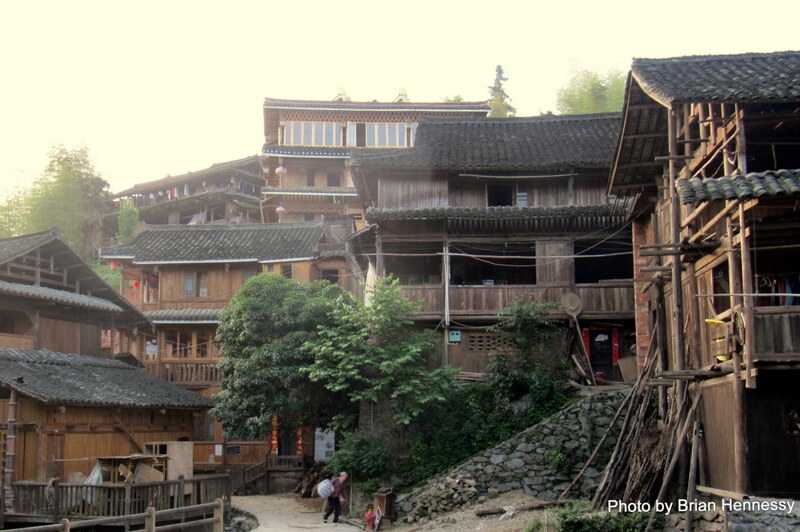 There are also much larger villages such as Zhaoxing in Guizhou (I visited there, but that’s another story) where smaller villages and their clans have expanded and merged into one large community. The clans value their kinship links and maintain their separate identities within the larger populace. 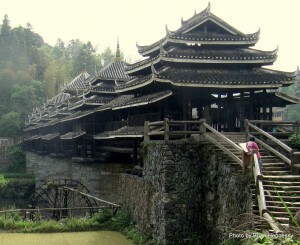 For example, each clan might have its own wooden drum-tower which serves as a social centre and a place for meetings and festivals. In the past, the main purpose of these towers was to alert residents to danger. For example; fire, or the approach of an enemy force. 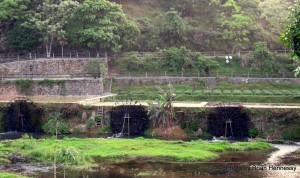 However, the most remarkable communal structures are the wind and rain bridges. 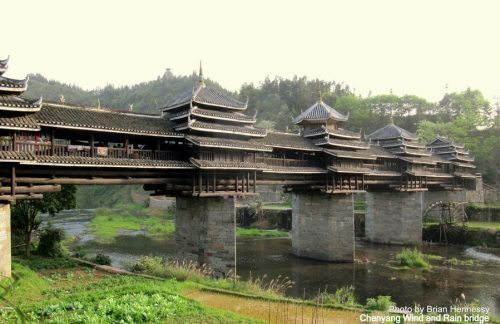 As well as their practical function – that is, a bridge across water – these wooden constructions shelter people from the elements and provide the local people with a place to socialise, engage in cultural activities, or just hang out. The wind and rain bridge at Chenyang took twelve years to build, was completed in 1912 – without any nails – and is regarded as one of the best examples of its type anywhere. Online photos showed a roofline of soaring eaves on five individual towers above hewn fir tree logs traversing the stream below. I had to see it. So there I was, outside a dusty, grimy bus stop in Sanjiang looking for some transport to take me to Chenyang 20 kilometres away in the countryside. 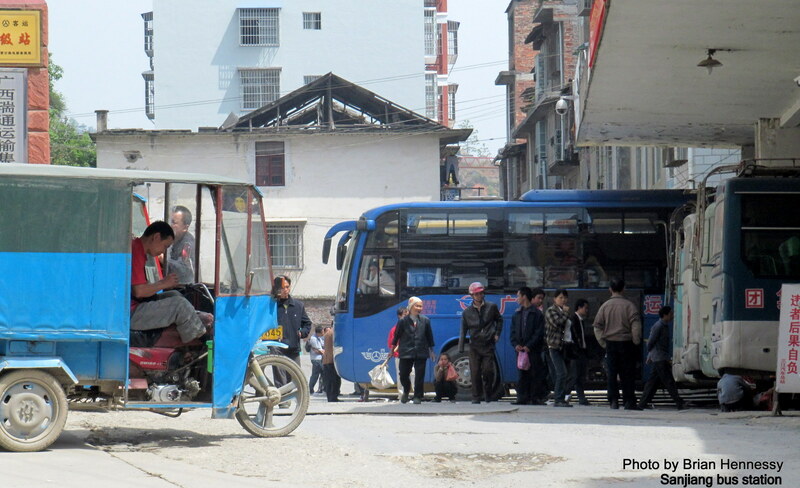 Drivers of three wheeled pedicabs fighting noisily for my attention and assuring me that yes they could take me all the way to Chenyang for just a few renminbi. Bu shi, not bloody likely. Loud motor cyclists hustling for a fare. Blocking my path and taking me for a Western fool who knew nothing and who could be cheated easily. So I broke out of the scrum and walked away hoping to find a minivan somewhere along the main drag. No luck, not a van in sight. Oh well, if I was going to be cheated, I might as well do it in style and go by taxi. It was a good choice. My backpack in the back seat, and a chance to have a bit of peace and quiet as I viewed the countryside, the people, the houses, and the occasional water buffalo, as life in a Dong Autonomous region rolled past. The pedicabs would have taken all day and a motorcycle would have bounced the crap out of me. Taxis in China are cheap anyway. So I was quite relaxed when we arrived in Chenyang, unprepared for this unique expression of Dong culture and talent crossing a clean clear stream in a lush green valley. What a bridge! I wasn’t expecting this. And in such a beautiful environment. Dong villages dotted here and there, following the flow of the waterway from the safety of the adjacent slopes. Gravel pathways between villages with a few folk passing from one place to another. 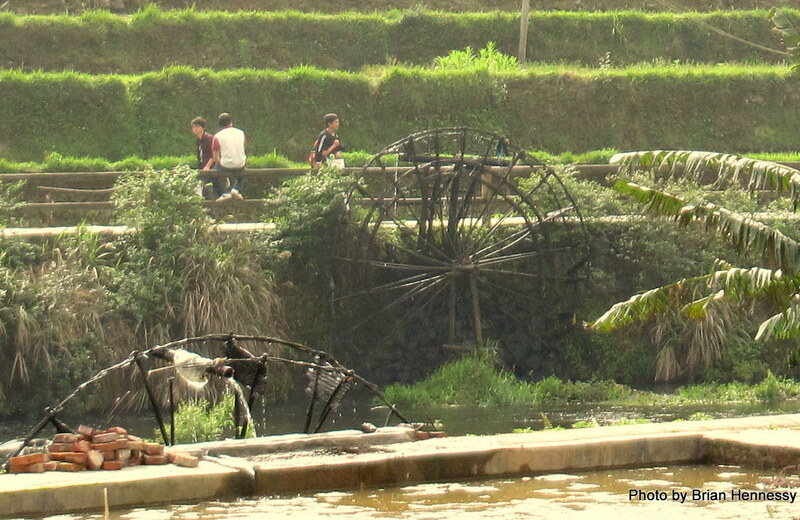 The slow turn of the water wheels, ruffling the surface of the stream as they scoop, lift, and spill their contents into the irrigation channels on the riverbank above. You see scenes like this in travel agencies. Tempting people abroad with a promise of something new and exotic. Customers wondering if such places really exist these days, and have the photos been doctored, and is there a five star hotel just behind the camera or hidden around the next bend. Well I can tell you folks, that it took some time to get here, that there are no fancy hotels, and as a matter of fact, no Western tourists either. Just me, a bridge, and the Dong. An independent traveller’s heaven. I walk across the 78 metre long footbridge with its five elegant multi-storied towers and thank God, Buddha, and the local spirits (the Dong are animists) that I am here to enjoy it. Now to find a place to stay tonight. In China. 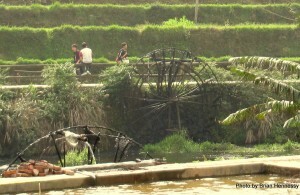 In the Dong Autonomous region of Guangxi. Well off the beaten track.